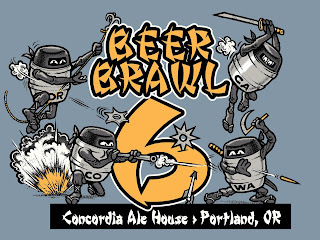 Concordia Ale House's Beer Brawl VI is in full swing as the four-state battle pits beers from Oregon, Washington, California and Colorado against one another in three categories: IPA, Pale Ale and Open on a 12-glass taster tray. In a departure from our attendance at recent "Cup" events, we hit it up early in the week meaning we'll have to wait longer to see how our favorites stacked up to the crowd favorites but that's the way the beer pours. As our taster trays were brought out smiles overtook our faces as we could immediately smell the hoppy goodness without even needing an up close inspection. Starting off with beer #1, in the Pale Ale category, I was absolutely delighted. The huge grapefruit/tropical fruit aroma and flavor were a siren's song, hitting high, bright hop notes. It took my vote for best in the category although #4 was a solid second choice. Moving on to the IPAs (#5 - #8) #6 stole the show for me with a lovely, stinky hoppiness. Then it was on to the final category, Open, with the first beer (#9) being strikingly different that the rest of the beers in this group. Either a stout or a porter, it was very tasty but for me couldn't compete with the others, of which two I suspect were Double IPAs. My final vote of the night went to #11 with #10 being an even closer runner up than #4 had been in the Pale Ale category to #1. Overall it was a very tasty taster tray and if I were to be given the option to vote for my single favorite on the tray that honor would have to go to #11. But since that isn't part of the voting I did the next best thing and ordered a pint of it. 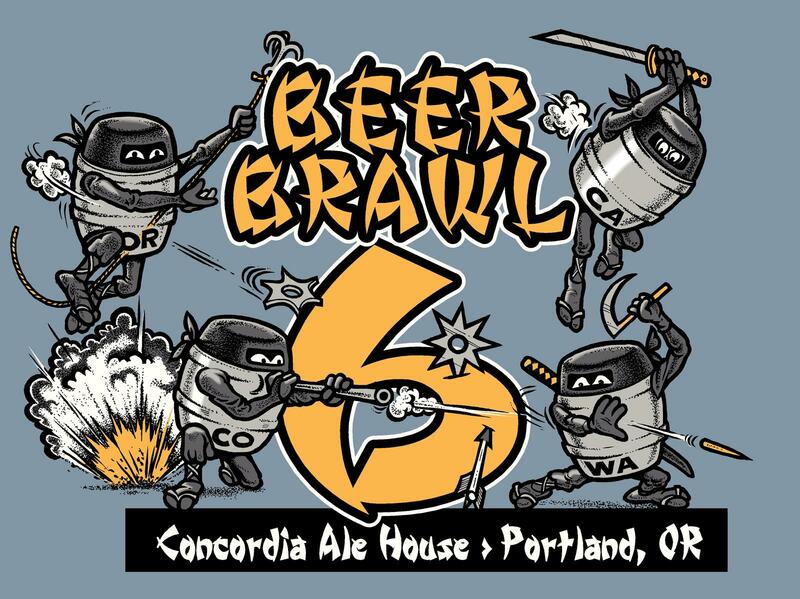 Beer Brawl VI runs through close of business on Sunday leaving you plenty of time to stop in and cast your own vote. I'm looking forward to Monday not only to see if my winners were echoed by the majority of the voters but also to have the identities of the beers revealed. Thanks to Concordia for creating such delicious drinking games! If you read my last post you know that I wasn't happy with the pairing of L'Amuse Gouda and 10 Barrel Apocalypse IPA. 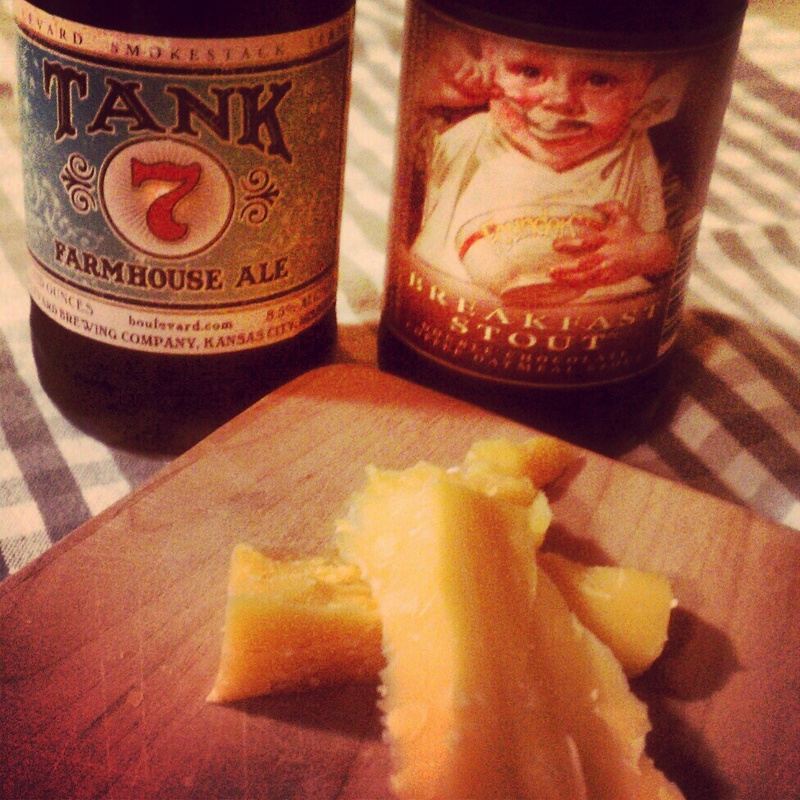 Last night I decided to try a couple of different beer pairings with this lovely, delicious cheese. Going along with the cicerone's suggestion of a saison I picked up Boulevard Tank 7 which was conveniently available in a petite 12 oz bottle. Searching my beer stash for a stout or imperial stout I came up with Founders Breakfast Stout. Tank 7 poured with a huge head, tropical in aroma and even more tropical in flavor. My concern with the overall lightness of the beer paired with this assertive cheese was unfounded. The beer stood up well to the cheese, possibly due to the 8.5% ABV (although it drinks more like a 6%) and offered a wonderful sweet and salty pairing. The Breakfast Stout offered up a great chocolate aroma, drank more boozy than the saison (although it's only 8.3% ABV) and greatly dampened the flavor of the cheese. While not as successful as the saison, it was still less discordant than the cheese than the IPA had been. We also happened to have an open bottle of double IPA in the fridge, Lucid Camo, which we decided last minute to try with the cheese. As with the Breakfast Stout the Camo overpowered much of the flavor of the cheese yet not quite as much, putting it second out of the three beers in our home pairing. With this pairing dilemna solved I can now enjoy the rest of this wedge of cheese. And I may be picking up some additional Tank 7. It's said that we often learn more from our failures than our successes. We can also learn from others' failures as well, which brings me to the subject of a recent failure of the beer and cheese pairing variety. A local establishment had the intriguing idea of bringing together a group of folks to pitch in to buy a BIG wheel of cheese. The idea took hold, the wheel was purchased and on the evening of the scheduled pick up the establishment paired the L'Amuse Gouda with both a beer and a wine. Excited and anticipating the event, I did a quick search to see what beer would be recommended to pair with a gouda. Beer Advocate lumped gouda with a couple other cheeses and listed a dozen possible beers including a stout or imperial stout. Craft Beer suggested a brown ale, altbier or imperial stout. Seeing the overlap and considering the time of year I was pretty sure a stout or imperial stout would be the beer presented. To my surprise the beer was an IPA, 10 Barrel Apocalypse IPA in fact. I tried to keep an open mind because although I love beer and cheese pairings I'm not skilled enough to make my own; I rely on the experts for that. No matter how hard I tried I could not get behind this pairing and after a night of it rolling around in my head I asked someone who is not just good at pairings but a certified cicerone. He suggested a saison and although that's not a style I love I plan to take his advice. I also plan to try it with a stout. So the moral of this little musing is that if the pairing had been successful I probably would have enjoyed it and kept moving. Instead, the failure of the pairing has led me to do some additional exploring and learning. Check back; I'll let you know how it all plays out because I have 1 lb of this delicious cheese in my fridge and it's going to get consumed one way or another. Last weekend I met up with a friend to get the latest pair of bottle cap earrings she had crafted for me. In the course of our conversation she mentioned that she'd recently been to the White Owl Social Club where their happy hour included $2 pints and tasty food. 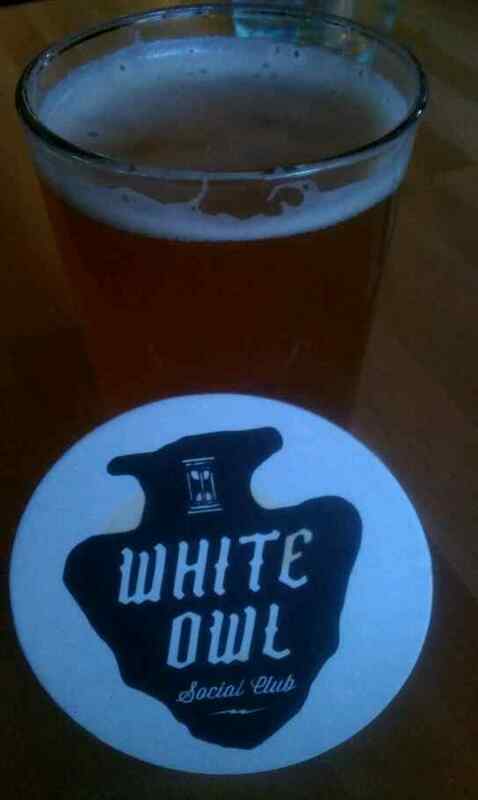 Not one to pass up an inexpensive pint, especially one so close to my inner SE abode, it only took three days from hearing about White Owl into visiting White Owl. Housed in a black corner building on SE 8th between Madison and Main, the space had been known by multiple names in the past, most recently Plan B. I had never been to Plan B although I did recall walking by it during a visit to a few distilleries in the area mostly because it seemed like such an odd name. So while I don't know what it looked like before I can say that the impression the solid black exterior gives (divey) is incongruent with what is inside. The interior, while modest in size is clean and contemporary, if a bit dark, with a combination of tables, booths, bar seating and an outdoor, covered patio. Hunkering down at a booth and taking a look at the menu it was clear that my friend had not led me astray. Indeed, happy hour is offered everyday from 3 - 6 p.m. with all of their draft beers $2, potato boots are 2-for-1 and burgers are $5. The beer was the primary draw and I was not disappointed in the 10+ offerings with Migration Black Hearted IPA and Stone Ruination particularly catching my eye alongside brews from Boneyard, Upright, Oakshire, Ninkasi, Cascade Lakes, Deschutes, Hopworks and Double Mountain. Being that we were there during happy hour we decided we should give the food a go, too. Potato Boots (loaded potato skins) can be made to order but we chose to go with the premade combinations of "Southeast Style" and "Gresham Style." Both were quite tasty as were the buffalo burgers we ordered a short time later. They aren't gigantic 1/2 lb burgers but neither are they the barely there "burgers" you get at a drive through. 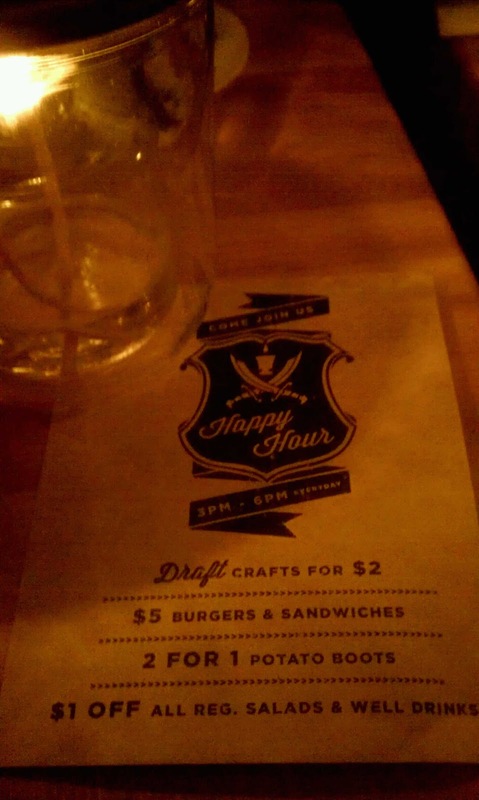 The non-happy hour price of $9 might be a bit steep but for $5, they're well worth it. It was a good visit (with none of the service issues noted on some Yelp reviews) and a place we'll likely be returning to soon, often or both. If you've checked it out I'd enjoy hearing what you thought of it. If not, make plans to stop in soon. For a good look at the place, check out Thrillist's slide show. 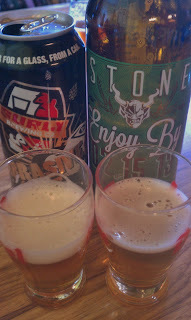 Whether he was inspired by my recent Abrasive versus Hopslam post or whether it was something he'd been thinking about before I was happy to take my friend up on an offer to do a double side-by-side comparison of double/imperial IPAs. Each of the beers is well regarded and I wouldn't pass up the opportunity to have any of them (and over a lot of other beers). But the real question to be solved was if offered this beer or that beer, which would I really prefer. The first "battle" pitted the highly popular, widely sought Russian River Pliny the Elder against the less well known Kern River Citra. Both clock in at 8% ABV, on the lighter end for a double/imperial IPA. 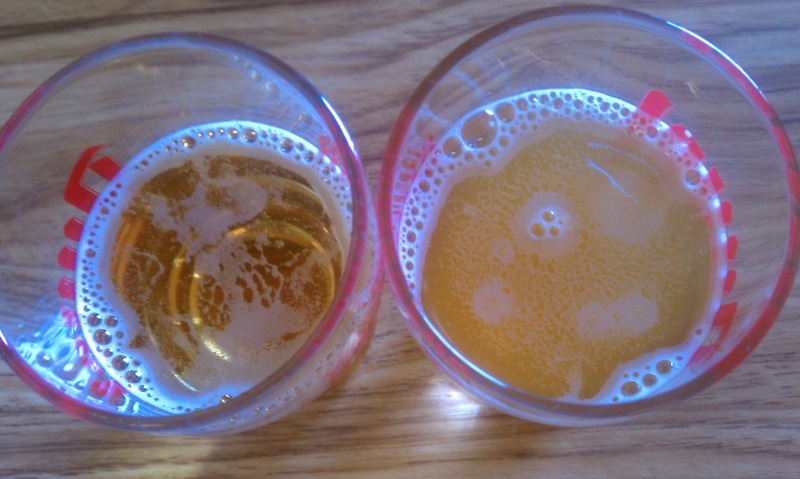 Pouring them Pliny came out crisp and clear while Citra was cloudy yet bright. The first sips offered a surprising and clear cut winner for me. 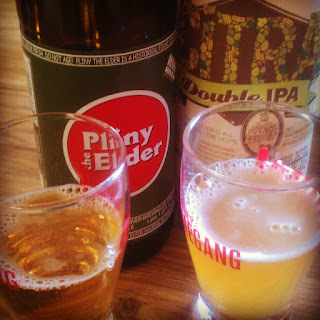 Pliny came across as one dimensional while Citra was balanced yet complex with the citrus bite one expects from this style. As they warmed I found Pliny to improve but Citra still easily won. The second "battle" matched the winner of my last side-by-side, Surly Abrasive, with the much hyped Stone Enjoy By 02-15-13. After pouring both it was more important than during the last "battle" to make sure to keep the glasses in their original spots as the color and clarity were almost identical. These are the next step up in the double/imperial IPA booze scale, coming in at 9.5% and 9.4% and were bottled/canned at nearly the same time. The beers were distinctly different in flavor yet I would be hard pressed to say which I liked better. Both made me want to keep drinking after each sip. In the end it's a matter of personal preference but I'd encourage you to do your own tasting of some of your favorite, same style beers. You might be surprised by finding a clear winner or equally surprised in being so dumbstruck by their deliciousness that you can't identify a clear winner. A while back I read a book, a strange book that I wouldn't necessarily recommend and one that was not about this topic, but it introduced the idea to me and it's been rattling around in my head ever since. The idea, of cities within cities, is really more of a way at looking at the world, particularly the familiar part of the world that each of us travels in regularly. 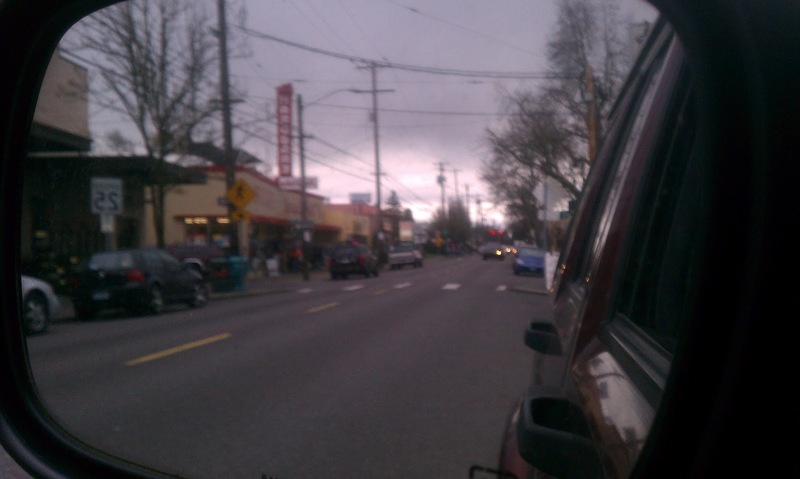 Depending on interests, two people walking or driving down the same stretch of road will see completely different things based on their use or function. The book talked about a woman who likes to dress herself well will see classy shops, jewelry stores and shoe stores where an alcoholic will see pubs, sausage stands and (here's the one that made me laugh) alleys where you can piss without being arrested. Then yesterday I picked up a friend to take her to an appointment and as we were talking about where the place was located she mentioned that all of her landmarks are bars and restaurants. When she said that I realized that mine are as well. Sure there are some other landmarks that I might reference depending on who I'm talking to, perhaps the pet supply store where we often buy bully sticks or the gym I go to for a particular class, but mostly it's the eating and drinking establishments that I see in any given area. At this point you might be wondering where I'll take this post now. The answer is nowhere. It's just a musing that was in my head and something you might ponder the next time you're going down a familiar street. A comment from a friend, questioning whether he should pop open a Bell's Hopslam or a Surly Abrasive, and some subsequent comments, embedded a thought in my head that I just couldn't shake. Which was better? I certainly think the world of both of them but I'd never actually had them side-by-side. As fortune would have it, I had both on hand and felt the urge to put them to a head-to-head test. 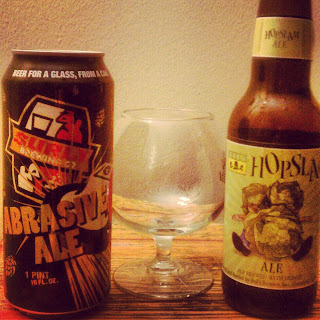 Nevermind that Hopslam is 10% ABV and Abrasive, at a "mere" 9% comes in a 16-ounce can. I knew I should wait until my better half was around but I just couldn't. It was like the pull of the leftover pie on the kitchen counter at Thanksgiving - irresistible. Departing from my usual haphazard home drinking style I actually consulted Beer Advocate for the appropriate glass for a double/imperial IPA. I don't collect glassware for different styles of beer but we happened to have a couple of snifters from last year's beer and cheese pairing that were just what was recommended. Checking into both of them on Untappd my previous ratings were Abrasive - 5 stars and Hoplsam - 4 stars. Note that until yesterday's Untappd update, only full stars were an option. I might have given Hopslam a 4.5 if it had been possible. I chose to let my previous ratings stand. Yes, I know the video is shot portrait instead of landscape. I got confused with my phone vs my camera. But doesn't it seem more peep show-ish and naughty? First impressions: Abrasive gave off an aroma letting one know right away that this is a high ABV beer while Hopslam offered a stinky, slightly honey nose. Neither were particularly carbonated with the head dissapating soon after being poured. Taking a taste Abrasive drank so smooth and clean the memory of the high test aroma was forgotten. Hopslam offered just the opposite with an unsuspecting aroma but a slam of flavor so strong the 10% wasn't to be questioned. Getting warmer: Abrasive's caramel aroma increased as it warmed and the flavor continued to be very pleasant. Hopslam's aroma remained fairly unchanged and stinky while the flavor seemed to get sharper. Conclusion: While I will still gladly drink a Hopslam or an Abrasive anytime one is available the winner in this battle was Abrasive. Perhaps next time I'll be more in the mood for a slapping around by the stinky hops in Hopslam. Whether or not you follow football you're probably aware that "The BIG Game" is coming up on Sunday. While I do follow football I don't care which team wins this match up but I am looking forward to a reason to gather with friends to drink beer and enjoy some tasty food. If you're hosting a party or attending one and contributing to the spread perhaps you'd like to impress your friends by not just bringing beer or food but bringing a food and beer pairing. There are plenty of resources to help you put together a match made in flavor heaven including North Coast Brewing's beer and food pairings and Smashburger's Summit beer pairing menu. 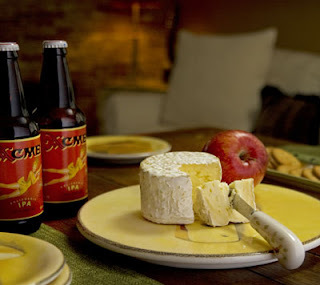 A cheese plate is one of the easiest, most hassle free ways to present a beer and food pairing. A couple of cheeses, a couple of beers and some crackers or bread and you're done. North Coast's ACME IPA pairs beautifully with Cowgirl Creamery's Mt. Tam triple cream (CA) and for a more decadent pairing try Old Rasputin with Epoisses de Bourogne (France). Perhaps you want to tackle something more ambitious. How about grilling up some burgers or sliders? Pair a Swiss cheese and sauteed mushroom-topped burger with Summit's Great Northern Porter or cook up some bacon (it does make everything better) and slice up an avocado to top a burger served with Summit's Pilsener. For those with a great cheese shop nearby, like the Cheese Bar in Portland, you could stop in to get their recommendations. Or perhaps you know someone like Michael Agnew who has a wealth of knowledge about beer and foods that pair well with it. Whether you strike out on your own or employ the knowledge of someone else I'd love to hear what your favorite beer and food pairings are and/or what you'll be eating and drinking this Sunday.